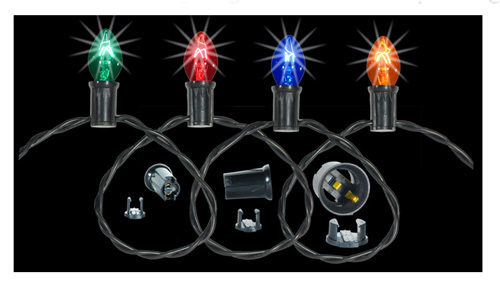 Wiring Sets & Coil Wiring - Northern Lights Display | Banners, Flags, Lighting & More! New nylon sockets last 67% longer than poly sockets! Wiring sets are only available in 25′, 50′ and 100′ lengths. 100 foot wiring sets have the male plug only. Coil wiring comes in options for C7 and C9 size sockets and is available in white or green wiring colors. Coil wiring is an economical option when refurbishing existing decorations, allowing you to fit and slice the wiring around the frame of your decoration for a custom fit. Upgrade 16 and 14 gauge wiring can be used to refurbish decorations but the wiring is green or black and cannot be used on silhouette frames for white decorations. 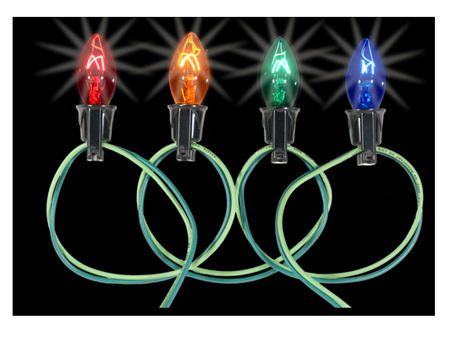 Upgrade 16 and 14 gauge wiring is recommended for building trim projects and for very large pine tree lighting. Upgrade custom wiring in 16 gauge Nylon socket and 14 gauge Bakelite socket options are available and sold by the foot or in bulk. Nylon upgrade wiring is the recommended wiring for large trees. This wiring lasts 67% longer than the poly coil wiring option. Bakelite upgrade wiring/sockets comes with pin sockets that snap on and off connecting the pins in the sock to the wiring. Contact our office with your lighting project and we will recommend options most suited to your needs.